How tall is Bradley Steven Perry? American teen actor Bradley Steven Perry was born in California, USA (November 23, 1998). He has 3 sisters. Perry started his acting career in the movie Choose Connor when he was eight in 2007. In 2009, he had a small role in Opposite Day, and had roles in Who Shot Mamba? and The Goods: Live Hard, Sell Hard. Perry also had a role in Sharpay’s Fabulous Adventure as Roger Elliston in 2011. He has a voice role in the psychological thriller movie Peacock. How much does Bradley Steven Perry weigh? 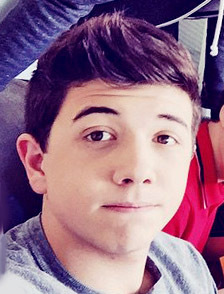 Bradley Steven Perry’s weight is 139 lbs (63 kg). What shoe size does Bradley Steven Perry wear? Bradley Steven Perry’s shoe size is 8 (US), 41 (EU), 7.5 (UK). In 2014, Bradley Steven Perry started dating American singer and actress Sabrina Carpenter.